Oh sure, the home-growns of Walla Walla can laugh at themselves and even sing “Oo ee, oo ah ah, ting tang, Walla Walla bing bang” with Alvin and the other Chipmunks, but when it comes to wine, well, they take their wine very serious. It ain’t no laughing matter. Walla Walla boasts a history-peppered downtown, charming old tree-lined neighborhoods, green parks and a bit of fresh liberal air from Whitman College, Washington’s oldest and most expensive institution of higher learning. This laid-back but sophisticated town of 30,000-plus has an eclectic style that resonates about the town from conservative third-generation cowboys to “big city” transplanted gay businessmen who all mix harmoniously at local wine bars. 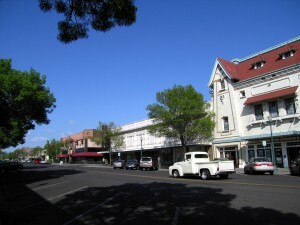 Wine is nothing new for Walla Walla, with its strong influence of French and Italian settlers. In the early 1800s Walla Walla Frenchtown, now known as Lowden, was established by a group of beaver hunters who were also the first to plant grape vines in Washington State. Shortly after, Italian farmers came to the valley and developed their truck gardens. European grapes were planted and the immigrants would soon covet the Cinsault grape for their home use. This Rhône varietal would eventually be nicknamed “Black Prince” by the Italian winemakers. During this time commercial winemaking was explored in Walla Walla. One ambitious Italian “Godfather” who owned several acres of vineyards would make annual treks to California, bringing back tons of grapes for his projects. Of course, Prohibition would eventually put a stop to any commercial winemaking, or at least any visible and public winemaking, that is. The last of these old vines were pulled out in the mid 1950s. In the mean time, the only “winemaking” going on in Walla Walla County was illegally made inside the walls of the Washington State Penitentiary. Prisoners were known for their own signature wine—“Pruno”—a contraband concoction made from fruit, ketchup, potato peels, bread and any other fermentable table scrap they could hide in their state-assigned trousers and shoes. The French and Italian wine roots of the past would eventually come full circle to this sleepy little farming town of Walla Walla that had been known agriculturally for wheat, peas, asparagus, sweet onions and canneries. In the late 1970s the first winery to draw local and later national attention was Leonetti Cellars. Owner Gary Figgins could trace his Italian winemaking roots back to his maternal grandparents. Along came Rick Small, a friend of Figgins, who founded Woodward Canyon, and Jean and Baker Ferguson, who founded L’Ecole #41. Both Woodward Canyon and L’Ecole #41 set up shop in the small town of Lowden. In the mid-1980s, the Walla Walla Valley became an official American Viticultural Area (AVA). Young vintners from France were soon lured to the area because of the long growing days and the lush green valley. The valley around the rugged Blue Mountains resembled their homeland, and sat on the same latitude as France as well. A young French vigneron, scion of the Champagne House of Albert Baron, planted vines for his Cayuse Vineyards in old dried river beds that reminded him of the cobblestone vineyards of France. And when Christophe Baron enthusiastically embraced “wine witchery” (scientifically named “biodynamics”) and started burying cow horns filled with dung at Cayuse and managing his vineyard according to lunar and planetary cycles, not an eyebrow was raised. Chalk it up to a long legacy of spiritual tolerance. You see, Walla Walla’s earliest native citizens were members of the Nez Perce, Umatilla, Cayuse and Walla Walla tribes with their own spiritualism deeply based in nature. Like the movie Field of Dreams, if you build it they will come–and they did. Wineries, first-class restaurants and accommodations were built. The Walla Walla Valley now boasts more than 130 bonded wineries and some 1,600 acres in vineyards. The local community college built the Center for Enology and Viticulture, attracting students from all over the United States come to obtain wine and vine certifications and degrees. Chateau Ste. Michelle and internationally known Precept Wine Brands made their presence known with Walla Walla-based wines. Long Shadows Vintners brought to the valley a partnership of six internationally acclaimed winemakers, including Michel Rolland, Agustin Huneeus Sr. and John Duval, to produce wines in Walla Walla from Eastern Washington vines. –Catie McIntyre Walker was born and raised in Walla Walla, WA and is the original Walla Walla wine blogger and “locapour.” After almost eight years of cleaning spit buckets and puring for the masses, she hung up her cork screw to pursue her writing and open her online wine store, Walla Walla Wine Woman. Great recap on the history of wine in Walla Walla. I never new the orgin of “walla walla bing bang” as in “Oo ee, oo ah ah, ting tang, Walla Walla bing bang” And I thought it was just a Hot Poop thing! Anyway – wonderful reading from Catie McIntyre Walker as always. Cheers! Great article! I’m considering coming to the American Wine Bloggers Conference in June 2010 in Walla Walla and your article is the best introduction to the area. I’d be happy to read more on Walla Walla. Any recommendation? Great read Catie! Thanks for all the publicity for my old home-town! Great article. I am new to wine so thanks for the info. Heh…learning about “Pruno” was both fascinating and disgusting all at the same time! Great read.